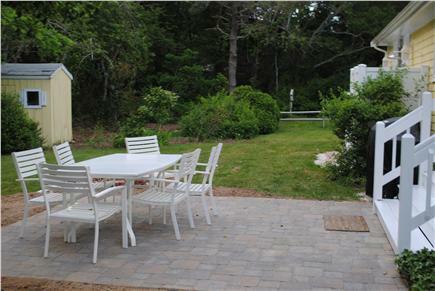 This clean,fresh 2-bedroom, 1-bath and outdoor shower, summer rental is located only 4/10 of a mile from East Sandwich beach and just a short drive to Sandy Neck and Town Neck Beaches. 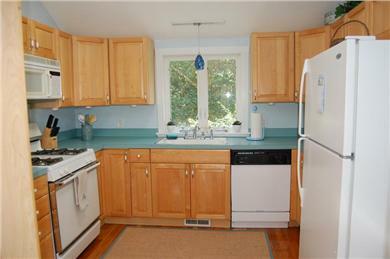 It is situated on a private lot surrounded on two sides by conservation land and has a good size back and side yard. The house is bright and open, with skylights, sliding glass door and french door, and vaulted ceilings. All floors are hardwood and the outdoor shower makes it easy to keep the sand outside! The house has 2 bedrooms, 1 bath with laundry - NEW full size washer and dryer, family room, dining area, kitchen -NEW dishwasher, and an 18' x 18' living room. It sleeps up to 6 people with a queen bed, two twins, a pull-out sofa and a futon. The beach is on the Bay side with access to Scorton Creek just 3/4 of a mile away, for great kayaking and fishing. Bicycle on the nearby canal rail trail or mountain bike in the Barnstable conservation area (Trail of Tears) only 3 miles away. 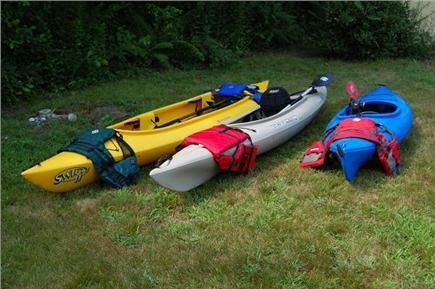 Bicycles and kayaks, beach chairs and toys are available for guests use. Available May 15 - October 15 as well as for long-term winter rental. Long-Term Rental (1 month or more): For long-term winter rentals, rental period begins October 15th and goes until May 1st . Pricing is $1300/month plus utilities. So glad you had such a great time for your honeymoon. We are always glad to hear the effort we put into making our home pleasant and comfortable is working! Hope you can come back again someday. This was a lovely house and had a great yard. We really enjoyed our stay here. A quick weekend away in June and this was the perfect spot. Only wish we could have stayed longer. Everything we needed was in the cottage and it was beautiful and spacious. We just returned from our stay in this beautiful home. Everything was great! A wonderful home, with every amenity imaginable, even kayaks! Our family made so many wonderful memories during our stay. As a Realtor, for over 28 years, I was very much impressed by the amenities, cleanliness, décor, grounds, location, and spaciousness of this vacation home. I highly recommend it and cannot wait to come back! Thank you for making our vacation so memorable! Thank you so much for the kind words. It is great to hear that you enjoyed our place as much as we do. We look forward to having you back in the future. 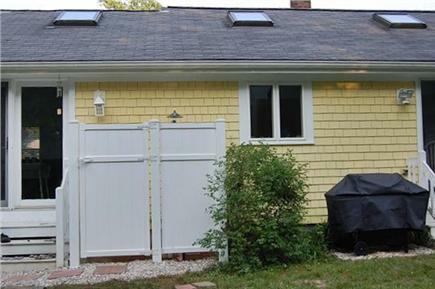 Typical house of Cape Cod: greater and more beautiful than the pictures. 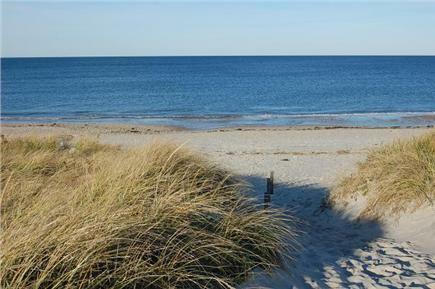 The beach of Sandwich is very wide and sandy and within walking distance. Using the beach buggy of the cabana, it is very easy to transport the equipment to the beach. We have been surprised by the generosity of the homeowner who provided all that is necessary for a good vacation week: bikes, kayaks, chairs, games for the outside. This was our 3rd year on Cape Cod and the best rental! We chose this house based on the photos and the great reviews and were not disappointed. Actually, this is the third vacation house I've rented with my husband and two kids (7 and 4), and we all agree that it was the best. Impeccably clean, the beautiful decor inspired relaxation. It is also more spacious than it appears to be. The house had everything we needed and more, all in excellent condition. What a beautiful location. We have been vacationing on the Cape for 50 years and this truly was the perfect spot for my Mom and I to get away. The house is decorated with every detail in mind, and is so relaxing, you never want to leave. The owners were very easy to communicate with. We have been recharged yet again by the Sand and Sea! 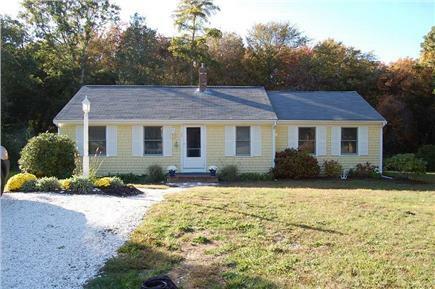 We have had this house on the Cape for over 6 years, and we love it! We have three children who are now grown, but still love to come back to enjoy the area. There is much to do for all ages! 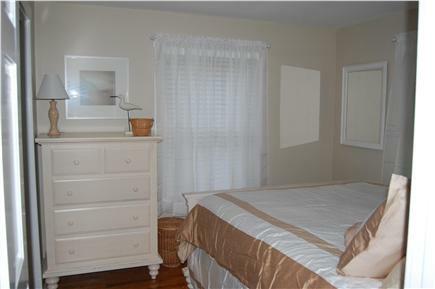 We're typically fully booked for the summers and our renters are always happy with the place and amenities. One comment we hear often is how clean the place is. With all hardwood floors and an outdoor shower, it's easy to keep the sand and dirt out. 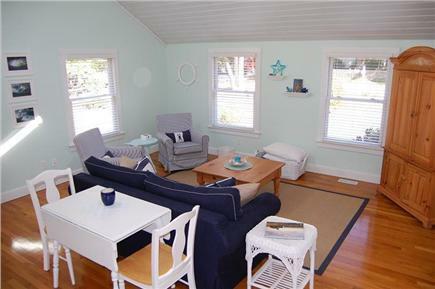 And with skylights,lots of windows and beachy colors, it's bright and cheery. The beach is just a 10 minute walk or a 4-5 minute bike ride! There are games for the children (and adults) to play on the side yard- ladder ball and croquet to name a few, ride the bikes down through the neighborhood or take the kayaks out on the creek. And on rainy days(of which hopefully you don't have many! 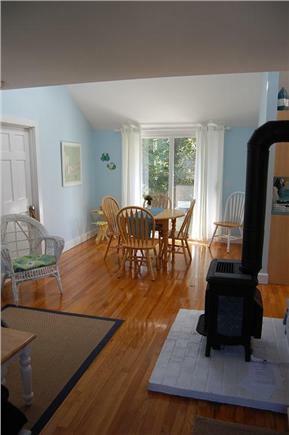 ), the cottage has a large living room and a front room so there is plenty of space to spread out. You can play games at the dining room table or the living room checkers table, watch TV or videos in the living room or enjoy some quiet time and read on the futon in the front room. The house is surrounded on two sides by conservation area, and tall trees between you and the next closest neighbor giving you lots of privacy. And, the conservation area has some really nice trails to explore. Finally-it's not far over the bridge, so while everyone else is still traveling, you're already settled and enjoying the beach or exploring the area! There is so much to do in the area as well as the rest of the Cape, you'll wish you could stay longer. The beauty of this place is, with the beach, Scorton Creek and the marsh so close, there is plenty to do without going far. And yet, if you wish to check out everything else on the Cape, you have a great starting place. 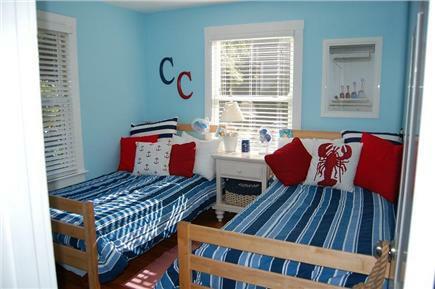 The cottage has a binder in the front room with all the local amenities as well as others farther down Cape. Although the cottage is away from the busier downtown, you are only a 10 minute drive from the local stores- Stop & Shop, CVS, Hardware Store, banks, beauty salons, liquor store, the Deli, quite a few good restaurants and some souvenir shops. And, of course- only 10 minutes away from the best ice cream on the Cape at Ice Cream Sandwich, across from the Stop & Shop Plaza. If you just need a paper or milk you can walk to the end of the street to the small convenience store, or if you're hungry for breakfast but don't want to cook, walk to the end of the street for breakfast at the 6A Cafe or just want to browse, stop at Titcomb's Bookstore at the end of the street. And Heritage Park with great gardens, museums (including an antique cars museum) and the all new Adventure Park is a 15 minute drive and well worth the money! You can choose to just relax, but if you want to explore, you will never be bored!